Newberg High School opened its track and field season last week with a meet at Gresham High School. The Tigers joined Gresham and Barlow at the meet and showcased some of their talent – particularly on a boys side that is resetting after graduating many state contenders. The boys team enters the 2019 season having lost many of its best athletes to graduation, but a talented group of sprinters will lead the way for the Tigers this season, NHS coach Brandon Ramey said. Junior Riley Beecroft is at the head of the pack and will compete in the 100- and 200-meter races. Seniors Matthew Larson and Kyle Hatch are among the leading sprinters as well. Outside of the sprinters group, senior Jake Thompson is expected to contend for a title in the triple and long jump, among other events he participates in. 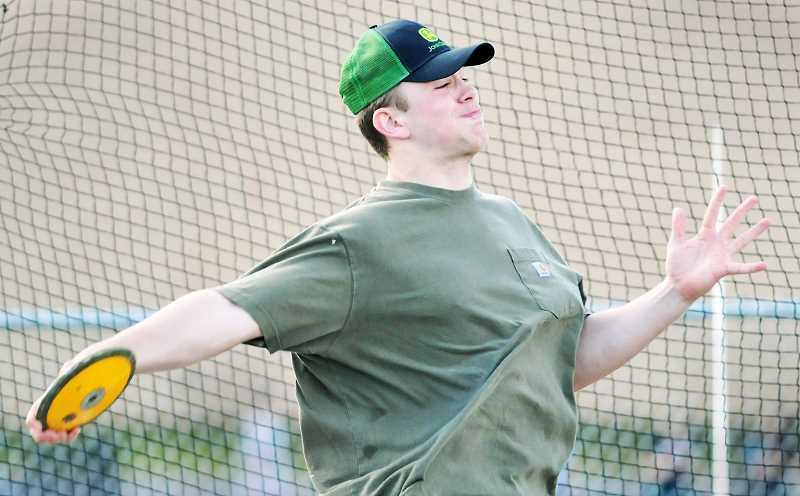 Junior Jared LaPointe is a force in the discus and javelin as well. Filling the shoes of now-departed athletes across multiple events is going to be a challenge for the boys this season. Building their legacy is something Ramey said the team needs to focus on. "We lost some guys that had been school record holders for us," Ramey said. "They've moved on to college and have been running really well at different Division I universities. It's going to be tough to replace them, but we've moved to a new conference that might give us some more leeway." The boys are as young – and lacking experience in some cases – as the girls, but Ramey said the tradition of the program and its practice habits should bring positive results now and into the future. The work ethic this group has displayed, he said, has been encouraging in the early stages of practice at NHS. "I'm really proud of this group so far," he said. "They've been working really hard, showing great leadership and helping the new kids coming in." Newberg traveled to rival McMinnville on Tuesday afternoon after press time. Its next competition isn't for another two weeks, when it faces Liberty on the road. The Chehalem Field and Track Classic — Newberg's home meet — is on April 5. Other teams in attendance will include Beaverton, Central Catholic, Clackamas, Crater, Forest Grove, Franklin, Glencoe, Hillsboro, Lakeridge, Mountainside, North Salem, Sunset, Tualatin and Westview. As the landscape changes and the expectations shift for both track teams, Ramey said the focus will be on the biggest meets of the year, which includes the Summit Invitational in Bend and the annual Twilight Relays at Jesuit. After that, it's time to lock in for district and state competition soon after for those who qualify. It remains to be seen if the Tigers can maintain the championship tradition of the past few years in a variety of events. Newberg will compete in the Pacific Conference this season after moving over from the Three Rivers League when the OSAA did its conference re-shuffling. The competition should be easier, according to Ramey, and although the Gresham meet was non-league, the boys team showed why it could have a successful season with its quality performance on March 14. Larson and Hatch finished second and third in the 100-meter race with times of 11.94 and 12.07 seconds. Larson got a victory soon after in the 200 with a time of 24.43 seconds, besting Hatch by 0.18. A relay team of Thompson, Beecroft, Larson and freshman Blake Smith took home a win in the 4x400 with a time of 3:50.16. Hatch, Thompson, Larson and senior Mason Darling won the 4x100 in 45.35 seconds. LaPointe flexed his muscle in the discus with a second place finish at 122-10, then followed that up with a resounding victory in the javelin by tossing it 162-03. The Tigers carried their momentum into McMinnville and hoped for a quality performance in the rivalry meet. Full stats and information on the meet are posted on Athletic.net. An account of the meet results will appear in the next edition of The Graphic in the sports section. Newberg's meet at Liberty starts around 4 p.m. on April 4. They will be the only two teams participating as the Tigers prepare for their home meet two days later.